Microsoft Corp is considering Qualcomm Inc Chief Operating Officer Steve Mollenkopf as a candidate for its new chief executive officer, Bloomberg News reported on Thursday, as it reaches the final stages of a four-month search process. The world's biggest software company is down to a "handful" of candidates with no clear leader, including a hitherto unconsidered technology executive, sources familiar with the matter told Reuters this week. In the past few months, most attention has focused on Ford Motor Co CEO Alan Mulally, a friend of Steve Ballmer, Microsoft's current CEO who announced his plans to retire earlier this year. Mulally is credited with rescuing the beleaguered auto giant, but sources said an external tech executive is in the running, plus one or two internal executives. 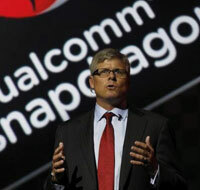 Microsoft declined comment on its CEO search, and Qualcomm declined comment on Mollenkopf's potential candidacy. People familiar with the process expect Microsoft to select a new CEO before the end of the year, although the committee formed to find Ballmer's successor gave itself 12 months to do its work when it was formed in August. Mulally, who helped Ballmer create his 'One Microsoft' overhaul and has seemed so far to be the most likely candidate to succeed him, is under pressure this week from Ford's board to clarify his plans. "I love serving Ford," Mulally told Reuters on Thursday, without addressing the speculation surrounding him. Mollenkopf, an engineer who holds several wireless patents and has risen to the top management ranks at Qualcomm since joining the company in 1994, appears to meet the requirements of the Microsoft CEO job laid out by Chairman Bill Gates last month. According to Gates, Microsoft needs a CEO who can run a "complex global business" and "work with our top technical talent."